This magnificent Necklace feature your individuality.The SPELL BOUND!! 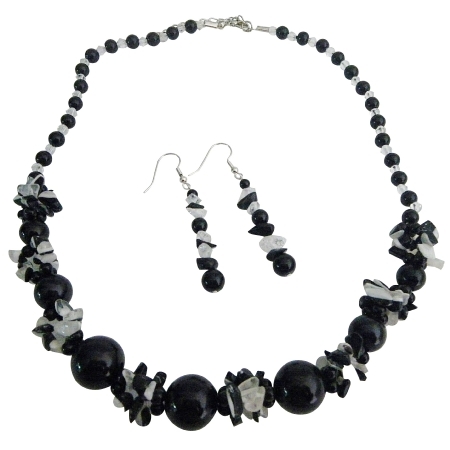 Beautiful looking Black Pearls with Black & White Cracked Glass Beads accented in beautiful Necklace & earrings Set. Earrings in Nickle free french hook adds all the fablous looks. A DAZZZLING complete Package only by us. The full essence of innovation & artistery involved in this set making it the World's most Beautiful ELEGANT & SOPHISTICATED affordable Pearls Bridal imitation Jewelry set!! Eevn ment for all the occasions.for all oufits. A LOVER'S Gift too. A Party on your Neck & ear lobes all the time! !.